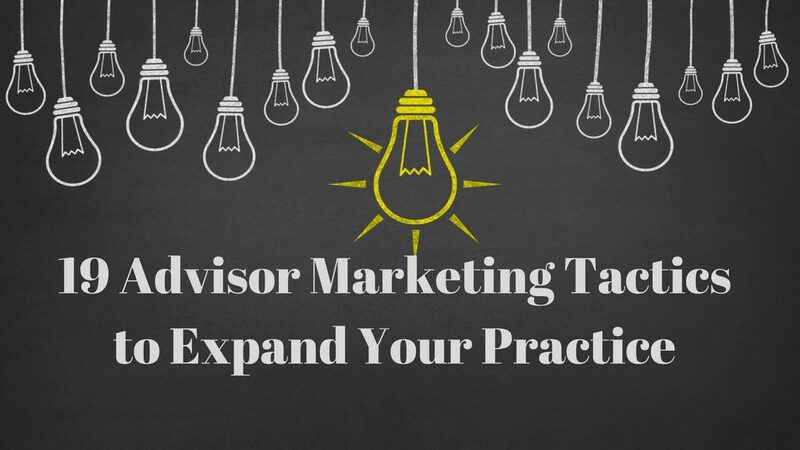 Before I get too far into this post, it’s important to note that, although this post is about advisor marketing tactics, it’s essential that your marketing “tactics” feed your marketing “strategies”. Your strategies are how you want to achieve your goals – your tactics are what you need to “do” to implement those strategies and achieve your goals. One could ask whether or not the only important marketing strategy is to increase sales and grow the business. Well, maybe. But a significant number of our financial clients come to us not just because they want to attract more clients… they come to us because they want “better” clients. For that very reason, we believe that one of the most significant advisor marketing strategies is to have a compelling advisor brand. It’s essential to have a solid solid and, as much as possible, a unique expression of who you are and what you do better (or differently) than others in your area of expertise. A good brand sets the tone, helps you get noticed for the right reasons and gives you the instant credibility your marketing tactics need to succeed. Since this article is about Tactics and not Strategies, I won’t belabor the point here but whatever the list of strategies are four your firm, establishing or solidifying your brand should be on that list. When it comes to marketing tactics for your financial advisor business, there are no magic bullets. Every advisor marketing tactic listed below needs a coordinated and significant effort for you to enjoy its success – and build your success. The tactics listed below are categorized into levels of importance. They often build upon and enhance the probability of success for other tactics. A well-articulated Brand with a clear audience. A powerful website with clear message and compelling content. Simple easy to say yes to call-to-actions. Nurture campaign with more value. Professional social networks (1-3) where you regularly share value.